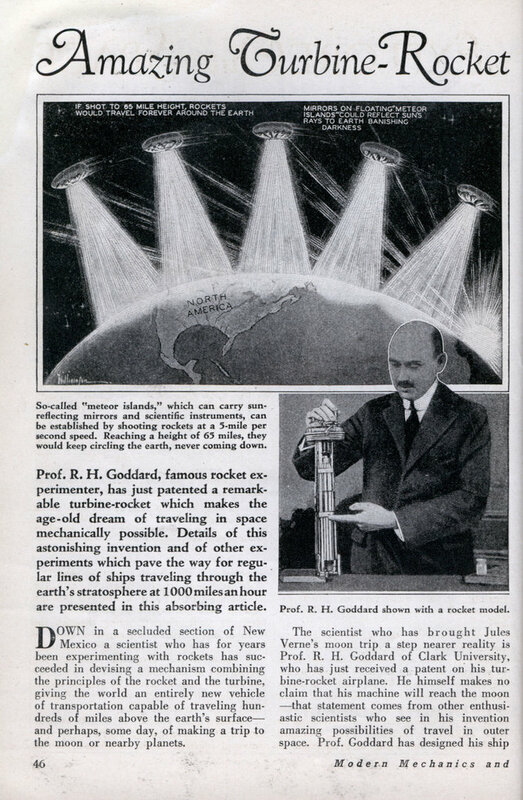 The scientist who has brought Jules Verne’s moon trip a step nearer reality is Prof. R. H. Goddard of Clark University, who has just received a patent on his turbine-rocket airplane. He himself makes no claim that his machine will reach the moon â€”that statement comes from other enthusiastic scientists who see in his invention amazing possibilities of travel in outer space. Prof. Goddard has designed his ship to travel in the earth’s stratosphere, which includes that layer of exceedingly thin air, trailing off into utter vacuum, which exists beyond ten miles above the earth’s surface. It is the combination of propellers and rockets which makes Prof. Goddard’s ship unique. Rockets are the most efficient form of propulsion known for high speeds, meaning speeds in excess of 600 miles an hour. Airplane propellers are efficient at slow speeds and in dense atmosphere, but lose their effectiveness when the air thins out at high altitudes. Therefore Prof. Goddard combines these two forms of propulsion, as explained in the drawing on this page. In beginning its trip from the earth, the rocket blast of the ship is directed through turbine blades which drive propellers. This drive is used when traveling through the comparatively dense atmosphere close to the earth. But when the higher altitudes are reached, the propeller turbines are swung out of the course of the rocket blast so that the ship is driven by rockets alone. Thus the two forms of power are used under their most favorable conditions. Whenever the subject of rockets is mentioned, the imagination conjures up pictures of journeys to the moon and planets. Scientific skeptics have always maintained that such ideas are fantastically impossible, but much of this criticism has been quieted recently by the experiments of Goddard and others. German experimenters, particularly, have perfected rockets to such an extent that one group has already charted a course from a field in Germany to one near New York, over which course rockets carrying mail or merchandise will travel. Parachutes opening automatically at the end of the journey solve the problem of landing the rocket and its contents safely. Fuels employed in driving rockets are of liquid composition. Explosive powder is definitely out of favor. Prof. Goddard uses gasoline mixed with liquid oxygen. A favorite fuel with German experimenters is’ liquid oxygen and liquid hydrogen, brought together through separate pipes and ignited. Germany has a Rocket Flying Field near Berlin especially devoted to rocket experiments, under the direction of Herr Rudolf Nebel, whose ultimate aim is to build rockets that will pierce the stratosphere and reach other planets. This end will be approached gradually, however. First Herr Nebel plans to build a rocket to shoot into the stratosphere, carrying scientific instruments; next, a rocket to shoot to Cologne, and after that a trans-Atlantic rocket to deliver mail in New York or Chicago in half an hour. The creation of “meteor islands” outside the earth is an interesting possibility opened up by these rocket refinements. It is a well-known fact that an object hurled into the air at a speed of some six miles an hour will, after reaching an altitude of 65 miles, remain there forever, traveling around the earth. Owing to the earth’s curved surface and its rotation, the object cannot come down. Such islands in space, Herr Nebel declares, can be devoted to innumerable purposes. Fitted with huge natrium mirrors, they can divert the sun’s rays to illuminate the earth at night. They can be fitted with astronomical instruments. They can be used as stopping points for rockets carrying passengers into space, and can be outfitted with provisions to sustain a staff of scientists. Fantastic? Certainlyâ€”but not impossible. Still another use for rockets would be to give us a long-distance view of what our earth looks like from outer space. Maxium Pudovkin, a young Russian engineer and inventor, has proposed that television equipment be installed in a rocket and a moving-picture of the earth be projected from it as the rocket travels toward the moon. The practical man may object that a rocket’s vibration would destroy delicate television equipment, but as a matter of fact rockets are now so well designed that they start with less jerkiness than an ordinary airplane. 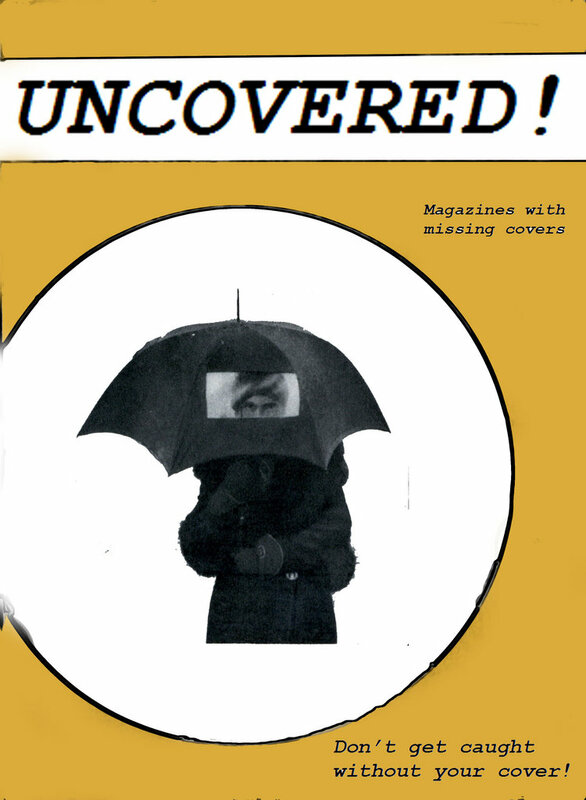 The value of a “space-visor” in checking up on maps and geographies is self-evident. It would be a simple matter to keep a photographic record of the television image. Although Prof. Goddard will not predict the exact distance which his turbine-rocket airship would be capable of traveling, in a paper written some years ago he proved that a series of rockets, one within the other, each fired as the one below became empty of fuel, could reach an indefinitely great height. It is uncertain when a turbine-rocket will be built from Prof. Goddard’s plans, although models have already been constructed. In one model the turbine blades, of thin steel, were insecurely mounted to the rim, and they were thrown more than 50 feet by the high speed produced by the rocket blast. The speed of the rocket, where maximum efficiency is produced, will be in the neighborhood of 3000 miles an hour. Even at this great speed it would take 80 hours to reach the moon. At 3,000 mph you’d never break free of the earth to get to the moon. Werner von Braun’s idea of multi-stage rockets cut back greatly on the necessary fuel. The elimination of night would play havoc with plant and animal life. And putting turbines behind a rocket motor would be a HUGE waste of energy, a major increase in mass and absolutely useless in space. But the Soviet idea of a TV in space would rock the world when finally made real. To us in the 21st century, the omission of radio relays in the ‘meteor islands’ is incomprehensible. Did scientists belive the atmospheric pressure dropped lineerally rather than logarithicmicly? Ha! Mechanical television! Paging Mr. Farnsworth! What? No clouds on earth? Lol.. still its a cool concept for a hybrid ship;looks funny and is out there but hey the stuff of steampunk is wrought. Note the point was not to use the turbine/propellers in SPACE but to use them low in the atmosphere where they WOULD be more efficent than the rocket motor itself. It’s not a bad idea at all though we’d use the turbine to turn a compressor fan for a jet-type engine rather than propellers. The idea is in fact named an “Air-Turbo-Rocket” several types of which have been used in missile and test aircraft propulsion systems.